To start my day, I love to sit down at the computer with a cup of coffee and look at all my favorite websites. When I have them, a handful of dried apples to munch on makes it even better. Dried apples are a good healthy snack anytime. Mix lemon juice and water in a large mixing bowl. Peel apples, one at the time. Place on cutting board and cut in half, lengthwise. Notch out stem and blossom end. Lay half down on cutting board and slice approximately 1/4 inch thick slices. Place slices in lemon water and repeat process with next apple. 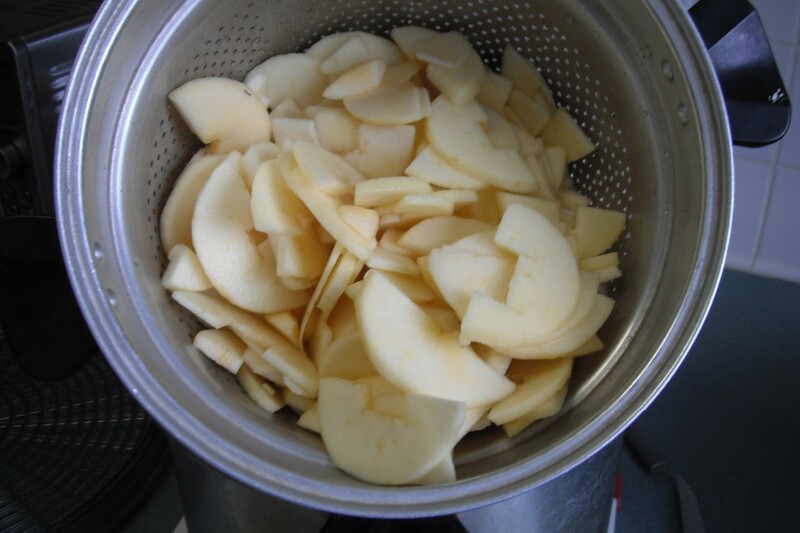 When all apples are in the water, pour them into a strainer to drain. 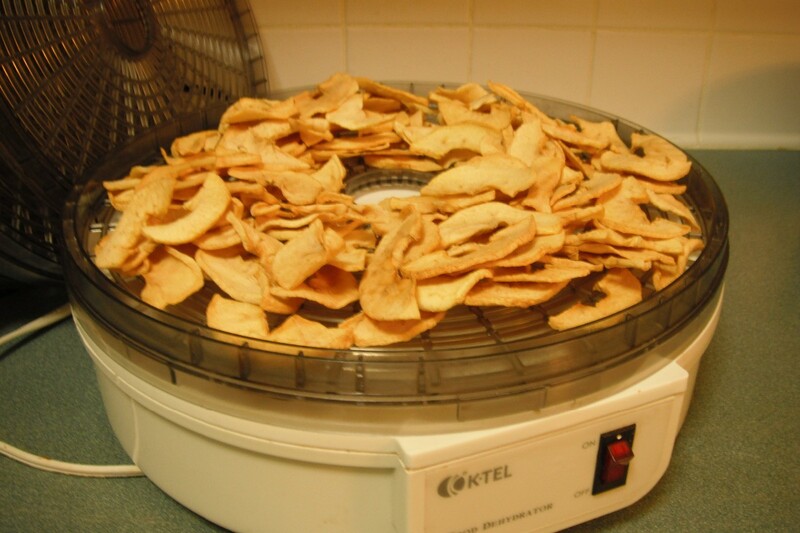 Place slices on dehydrator racks. Do not over lap. Dry for 6-8 hours. Rotate racks during drying process so they will dry evenly. 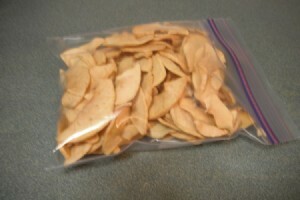 When all are dry, let them cool before putting them into a Ziploc bag. These would have to make delicious fried apple pies (or baked pies for that matter). I thought about you several times yesterday and today. A car hit me when I was a child. Broken leg, practically crushed ankle, fractured spine etc. I bought a little grabber from Dollar Tree. It's probably one of the best ways I've ever spent a dollar. Not having to bend over to pick up something sure helps at keeping back pain away. Several time while picking up something, I thought of you. Thanks again for that great tip. Thank you likekinds. I can feel your pain. You will love your reach extender and I'm willing to bet you will be buying some more. I also have back problems and had spinal fusion, L5 and S1 a year ago. I couldn't make it without my reachers. Since surgery, I have placed several around the house. Not being able to bend over, I use them for a lot of things. I even use one to take the clothes out of the dryer. However, believe it or not, walking the road and picking up litter is one of the easiest things I do. It gives me so much satisfaction. For me, it's a stress reliever and makes me happy. With my reach extender and bag on a bag holder, I do very little bending over. Keeping the litter picked up, I don't have to carry much weight to get it back home and in the trash where it belongs. 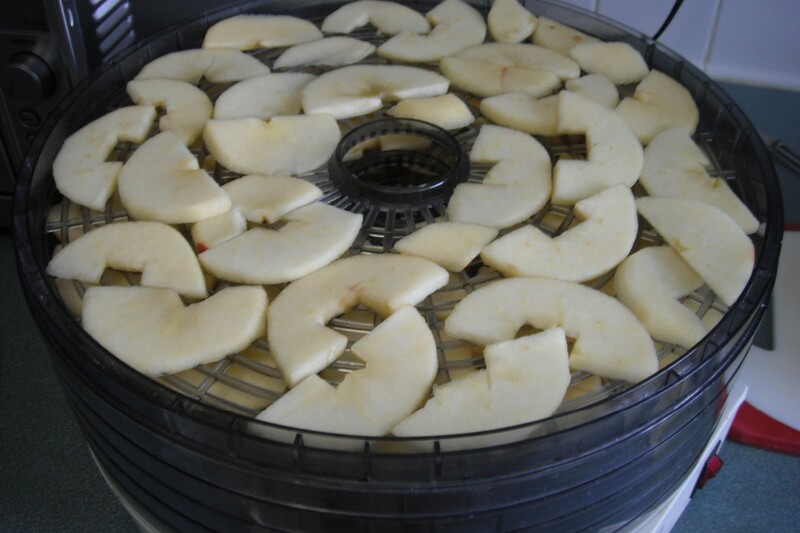 I make apple chips in my dehydrator too and they're a hit with the grandchildren. 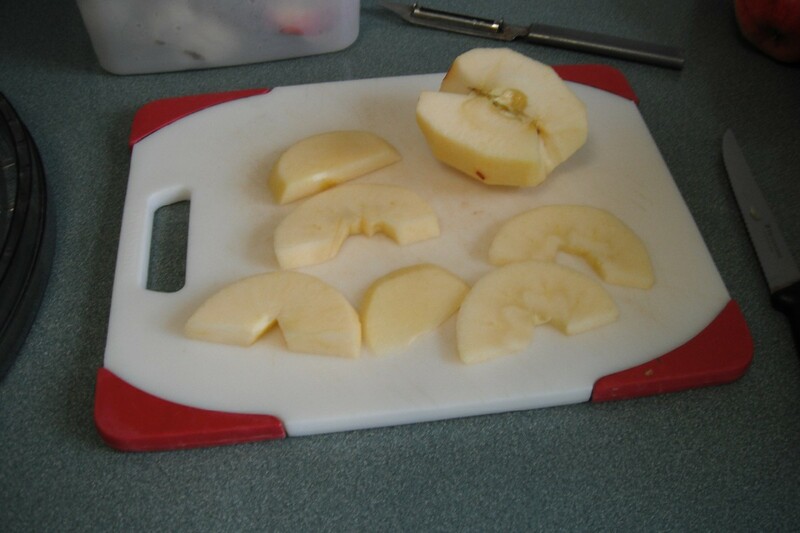 I use my adjustable slicing knife for consistent thickness apple slices and the job gets done more quickly too. 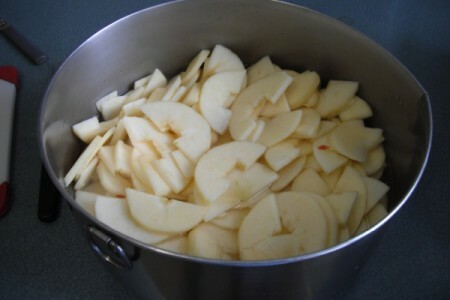 I bought mine at WalMart about 10 years ago and use it for everything including any firm fruit, potatoes and meat. I love home cooking but it does take time so if I can find a shortcut here and there, I'm pleased to take it. 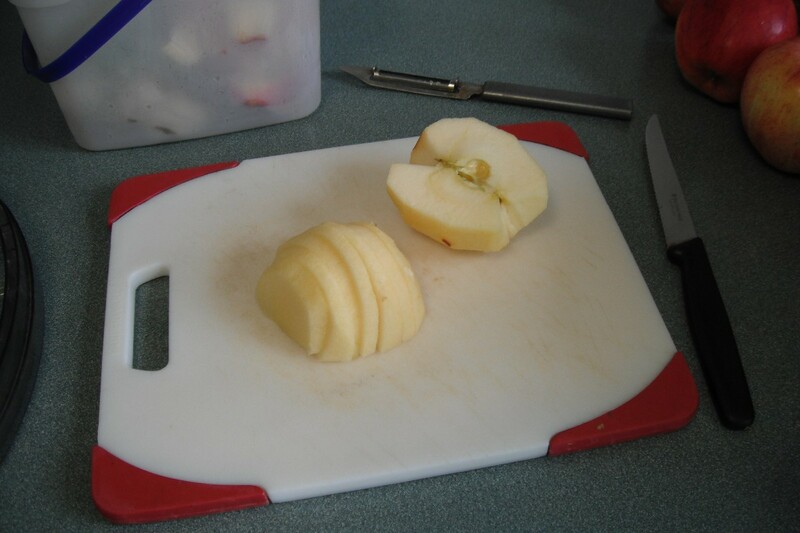 The knife makes slicing apples so easy.